I just added two new ships to the game, and thought I’d talk about the process that’s involved in determining ship stats, the types of weapon slots that they have, and the role they fill in the game. First of all, there are already lots of ships – around thirty if you don’t count fighters, and about a dozen more if you do. If you’re like me, that might set off some alarms in your head – why are there so many? Is it just variety for the sake of variety, or is it in fact meaningful? That’s what I always wonder about when I see a game tout “500 this” and “200 something-or-other” in their feature list. Not every ship needs to bring something unique or interesting to the table – if nothing is “average”, then it’s hard for anything to be special. On the other hand, if two ships fill the same role in the same way, that’s a bad sign – it’s a wasted art asset, and complexity added to the game that doesn’t pull its weight by giving meaningful choices to the player. 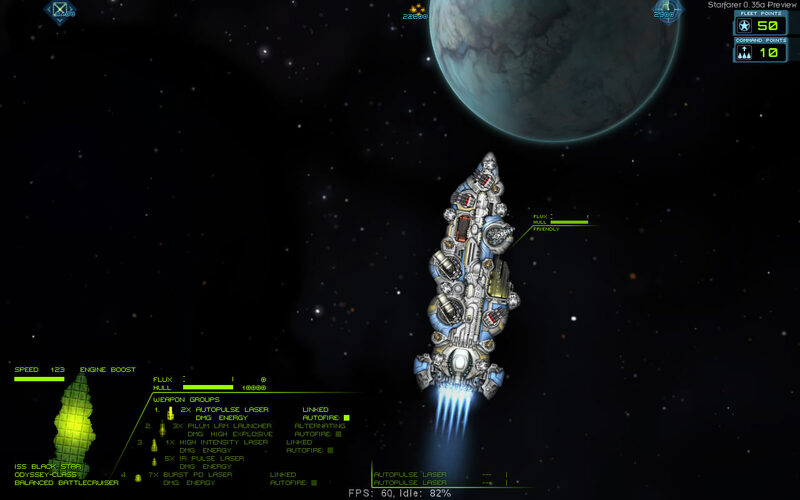 Still, having more ships is good if they pull their weight – it gives the player more choices and avenues for advancement, never mind more varied opponents. Having enough ships to give factions a stronger identity is important, too. So, what are the factors that differentiate ship designs? First of all, there are 5 size classes – fighter, frigate, destroyer, cruiser, and capital ship. We’ve also established three tech levels for ship designs – low tech, midline, and high tech. Low tech ships have high armor and a mix of ballistic and missile weapons. 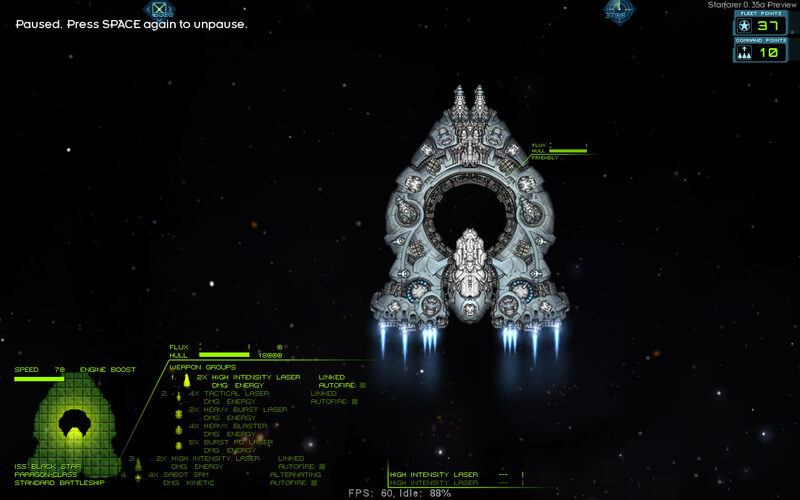 Midline ships have a mix of all types of weaponry, and average armor and shields. 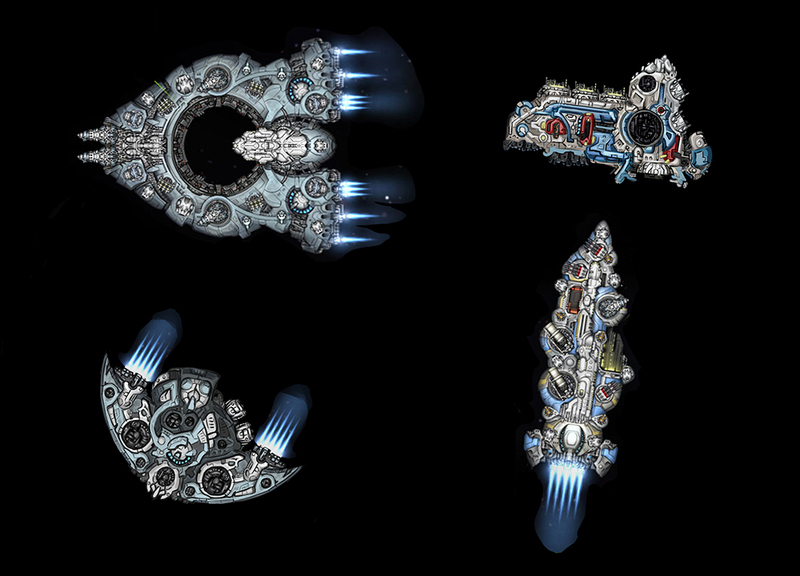 High tech ships rely on energy weapons and missiles, and typically have lower armor and excellent shields, in addition to improved mobility. Ships can also have launch bays for fighters – with some ships being dedicated carriers. Just those factors combine to create a lot of combinations – a low tech cruiser? A high tech carrier? 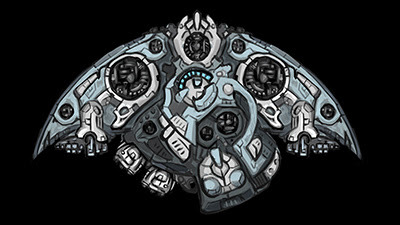 You can also easily make a ship distinct by giving it something special – such as, say, a weapon slot that’s too large to be normally found on ships of that size, or exceptional movement speed. Where the weapon slots are located and what arcs they cover is key to how a ship plays out – for example, having an important weapon battery point slightly to starboard will affect the best way to pilot a ship and will be a constant tactical consideration. To top it off, not all ships are dedicated combat vessels – they have stats such as cargo, fuel, and crew capacity. Down the line, I’d also like to add active ship systems (such as afterburners, a combat teleport, or an ECM device). Between all these, keeping ship designs varied is easy. Up til now, we haven’t had any particularly large high-tech ships in the game that could also put out a lot of firepower. But that’s about to change – allow me to introduce the Paragon-class battleship and the Odyssey-class battlecruiser. These two are anything but average. The Paragon is essentially a mobile battlestation. Its shields are the best in the game, and are backed up by a vast flux capacity. Its armor and hull aren’t quite that of the Onslaught (a low tech battleship), but its overall survivability is better. On the other hand, because it sports a large number of energy weapons – which generate a lot of flux – there’s a greater need to balance weapon and shield use. The mostly-energy arsenal also means the Paragon isn’t dependent on munitions being available, reducing its maintenance costs and giving it greater longevity in battle. Unfortunately, due to its focus on combat, the Paragon doesn’t perform well in other areas. It requires a lot of crew to run and has a low cargo capacity. The amount of fuel it consumes during hyperspace travel is staggering, and it has low fuel reserves. Using it effectively requires support ships – tankers, transports, and freighters, but even then, it’s not the kind of ship you’d want to have in a trading or exploration fleet. But when it comes to battle, it has no equal both in terms of survivability and sustained firepower. In contrast to the Paragon, the Odyssey is a nimble ship for its size and sports impressive firepower. In typical battlecruiser fashion, its hull, armor, and shields are sacrificed as a result – it’s outmatched by some heavy cruisers on those counts. Uncharacteristically for a ship with so much armament, it also has a fighter launch bay. Unlike the Paragon, the Odyssey is well-equipped for long-range exploration. It can carry a respectable amount of cargo, has lots of hangar capacity for fighters to tag along, and consumes a reasonable amount of fuel for a capital ship. It requires a bit more care in battle, but overall makes an excellent flagship, especially for a player focused on skills that improve the performance of their ship. … and now, if you’ll excuse me, I’m going to set up a large battle with these ships. Strictly for playtesting purposes! Nothing to see here, move along. This entry was posted on Thursday, December 8th, 2011 at 8:29 pm	and is filed under Development, Media. You can follow any responses to this entry through the RSS 2.0 feed. Both comments and pings are currently closed. Wowzer, 4 HILs! What is flux build-up like when firing all 4? The Apogee could fire it’s one HIL all day so long as you kept your shields down. If this can do the same with 4, that’d be a mighty feat. Very nice. I like the focus on different ships for different jobs. I also like the asymmetrical look of the Odyssey. I’m interested in seeing what the ships that aren’t suited for fighting will look like. I’m imagining the almost-unarmed tub that can carry a huge amount of cargo or the small, speedy blockage runner with mainly defensive capabilities that can zoom through blockades, carrying valuable cargo. Support ships are also interesting. I like the idea of tankers. An ECM-dedicated ship would also be interesting: it wouldn’t do much fighting itself, but it would enhance the abilities of the ships around it or mess up the guidance systems of enemy ships. There are a lot of possibilities. I’m very interested in seeing how this will all turn out. Wow, that is the bee’s knees. We knew that some large high tech ships were on the way, but this is pretty great! I can’t wait to battle an Odyssey against a Conquest! I particularly enjoy that it has a fighter bay honestly, that opens up some very fun strategies. @Kevin: Thanks! I like the asymmetrical ships myself, they are a bit more interesting tactically. Re: civ ships, if you have the game, the Venture is a hardened civilian ship, while the Hound is just the speedy blockade runner you described. And “tub” characterizes the Atlas perfectly. Wow, this made my day a bit happier! Great art, great insights. I really cannot wait to try out those two beautiful monsters. I love how each ship “feels” so unique. Great stuff! The new ships look great, the game looks great, can’t wait! Very cool, I am eager with anticipation. That is cool. So cool, I made a fanart. Have a fanart. Damn, you guys! I love the new ships. Great article, too. Hurray for more destructive array ! Now what I would like to know is if you were to pit a low tech capital ship against a hight tech one (ships made to the same battle tactics), which one would win and what kind of damage would the survivor would eat. While I understand taht usually High tech is considered stronger, there is also the common adage “simplicity is best”. And I follow it clearly since whenever I play a stargame, I love those huge clunky battery filled lumpy ships that have near zero shield but simply a few thousand tons of armor. the question is, will we have our own powerfull metal chuncks dreadnoughts (those based on the low tech aspect) that could rival with other same size ships more sophisticated (midline to high tech) ? BTW I really like the ship designs and all that has been done up to now. PS : Konstantin Vernikovskiy, your fan art looks quite similar to SPAZ’s Hookbill :p http://spacepiratesandzombies.com/mediawiki/index.php?title=Right_Hook. 3 high power batteries up front on a large horizontal hull with powerfull thrusters on the back, now that makes a good assault ship. Just a quick question: Can you pause the time in the game at anytime? A good example of what I mean is pausing the time with VATS in fallout 3, Mass Effect’s tactical screen or homeworld 2′s pause button. Does Starfarer have this? Not that it matters or if its good or bad for such a feature to be, but I’m just curious. @Troll: The short answer is, whichever one the player is in ought to win The Onslaught is somewhat underpowered right now, but I’ll take a close look at it. I’m a fan of low-tech ships myself, and the whole “simple is better” thing. Low-tech ships are already considerably more durable than high-tech ones. The Paragon is a bit of a special case, though – it’s just a very, very powerful ship, so I don’t think it’s fair to compare it to the Onslaught 1-1. @Reactorcore: You can pause at any time, anywhere by pressing “space”. It’s not a gameplay feature like VATS, though, just a convenience for the player… although you can give orders to your fleet while paused. @Troll It does, dudn’t it? I have played SPAZ, so that must have been what I was thinking about at the time. This ship was intended vaguely to be some sort of carrier, with three small bays, rather than a beam array, though. Logically speaking when we think of difference between low tech and high tech we end up thinking about economics. So will there actually be more low tech than midline, and more midline than high tech like one would guess about the “price” and avaibility of high tech stuff ? I do prefer your versions, they have more of a spaceship feel than SPAZ ones. They look more like assembled parts like on puzzles. On the carrier thing, I usually feel it fits way better to have the docks on each side of the ship, but that migh be because I always go for ships that blaze their way through and secondarily fit a dock or two between the ammo stocks if their is room. Position being essential in that cas so that fighters don’t either get fried by the engines or launched in the middle of heavy front batteries doing their stuff. If I were a spaceshipwright I would have the docks on both sides of a ship and aimed diagonally at around 33° to the bottom (yes I know it is pure speculations as to how one would build a ship with just imagined ships, but still pseudo realistic can be fun). Hah! SPAZ is everywhere. EEEeeevreEEEwheeeeRRRREeeee…. Srsly though, unintentional. I guess that ship might be shaped the way it does because it has more of the interior devoted to carrier-ing. Like that entire left part of the ship is pretty much dedicated to fighter storage and maintenance, and possibly some sort of ultra-rapid-deployment system wherein it shoots them into space O.o THe right part of the ship is dedicated to making that huge engine work, and a large beam mount for long-range support. I guess that this ship might have a really good thrust for its size so that it can get into a support position, and sit there and launch fighters and beams, not needing shields. Also to outrun persuers. 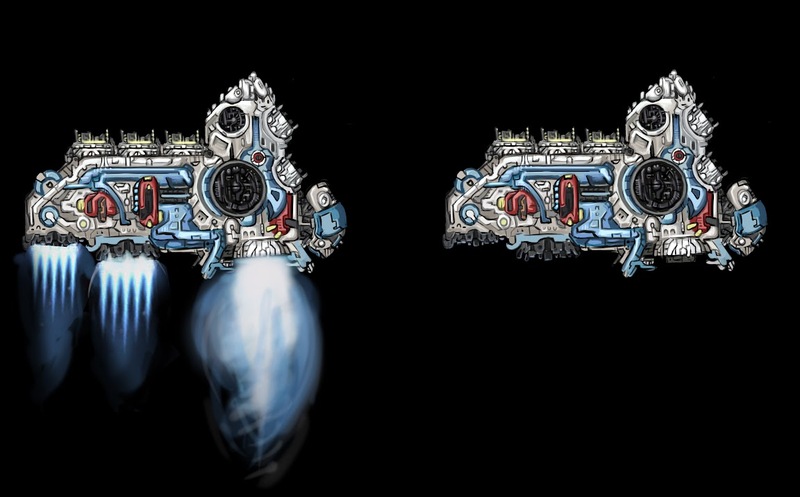 The engine might be so crazy it generates flux and prevents use of shields! Anyways it’s all silly fan speculation, mainly I be makin’ ships because pretty. Thanks for comment! @Konstantin Vernikovsky … wow. That ship is really sweet! You’ve got a lot of talent, makes me wish I could do something like that. Very impressive. Thanks for sharing it! If I was a space hobo, the Odyssey would be my dream vessel. @Konstantin: Once again, very cool I love the designs! @Troll: The conventional thinking about low/high tech doesn’t quite apply in the Sector, since manufacturing these ships depends on having the right blueprint. The low/midline/high tech designs actually represent the best from different eras of Domain technology, which span thousands of years. So, a low-tech ship isn’t necessarily worse than a high-tech one – it must have some redeeming qualities for it to be manufactured after all this time. So to answer your question, *better* ships will be more rare – but that doesn’t always mean higher-tech, though a majority of the time it does. Some high tech designs will be quite common, though – such as the Shuttle, or the Buffalo-class freighter. Once again another good thing to hear, the settings gives a consistant reson as to why ships are as they are, and I like the way you explain it. It parts from many games where “high tech” is always the winner, and you end up with the same best ships and always using the same tactics. On another note, do you think you will give some ships special weapons taht only they will have ? Like a fixed mount heavy artillery or such, or will you only make it that some ships have larger mounts taht fit higher ship sizes ? That came up early on in development, and the answer to having fixed weapons is no, at least for now. I think adding ship systems will be more than enough to give hulls plenty of personality. May end up adding a flag to make a certain slot non-refittable so that mods can explore this idea, though. On a general note, I’d like to have a big “make more things moddable” pass once everything is more stable. Hmm, is it just my eyes playing tricks on me, or are several of the weapon mounts on these two ships, considerably larger than any other previous large weapon mounts? For instance the Paragon seems to have 2 of these extra large slots on the sides, and the Odyssey 3 of them. Now this could just be a cool new large mount look for these ships, but I thought it worth mentioning because the mount size was noticeably different from any other I have seen before. Nope, that’s not your imagination, that’s what large turret slots are supposed to look like. The older ships that have large turrets will probably get tweaked later on to have similar-sized mounts. This game keeps getting better and better. Once again I must compliment the attention you pay to design and gameplay, and the comprehensive way you understand how these are two integral and related parts of the game puzzle. I don’t know if I could ever be comfortable with that kind of compliment – even if Starfarer was already out and lived up to all expectations – but just the same, thank you!